Why? Because the Elements and Salesforce username structure are slightly different. We wanted to make it easier to manage multiple Spaces and Orgs - from a single user Elements login - so we didn't copy the Salesforce approach. First we need to understand the naming conventions. A username is linked to an individual Org - a Dev, Production or a Sandbox Org. You cannot have the same username to log into multiple Orgs. Every username has an email address associated with it. Multiple usernames can have the same email address. A Space is secure, ring-fenced work area. Think of it as an "implementation of Elements"
DO NOT think of Spaces as folders. A corporate will probably only have ONE Space. A consulting firm will have one Space for internal operations and a separate one for every client. You can invite users to Spaces. They can then only see what is in that Space - provided they have been given view or edit rights. Every user in a Space can see the other users. An Elements user can be a member of multiple Spaces. One login - multiple Spaces. Whoever sets up the Space is the Admin. But you can assign admin rights to multiple people and Admin rights can be transferred by assigning admin rights to another, who then removes yours. A Space could be set up by a consultant and then transferred to the client at the end of the project. Finally, a user needs a separate license for each Space they are an Editor in. A Space can be FREE, PRO, PRO-TRIAL, ENTERPRISE or UNLIMITED. A picture... 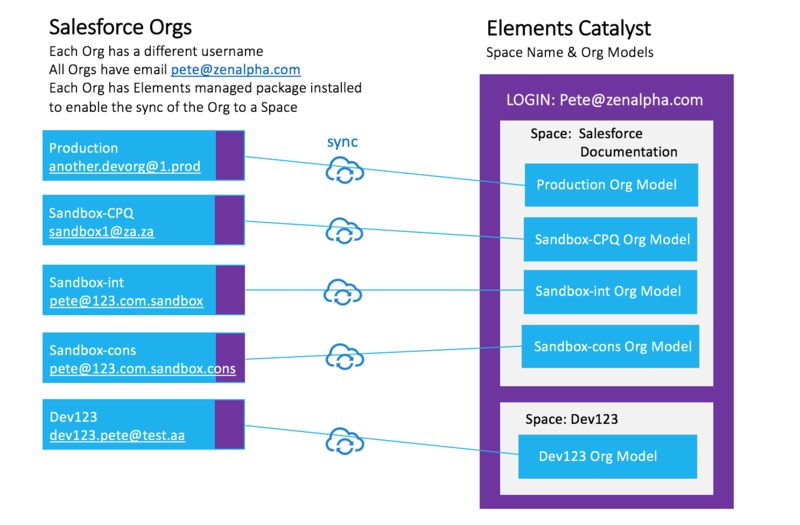 This shows how multiple Salesforce Orgs can be sync'd to Elements Spaces. Every Org needs the free Elements managed package installed from the AppExchange. This is the small purple box in the Salesforce Org in the image above. If you are existing Elements user and you want to sync with a Salesforce Implementation, you must use Manual setup. Do not use the Quickstart. If you are a new user, the first install can be using our QuickStart setup. That is because Quick Start creates a new Elements Space called Salesforce Documentation and sets up the connections. QuickStart can be used to connect a Dev, Production or Sandbox. You can change the Space name. Important: QuickStart will create an Elements username that is the email associated with Salesforce username for the Org you are connecting. The video is 5 mins long, but once the managed package is installed the set up takes 26 seconds - yes, I timed it.